Published December 11, 2017 By Leisa Good This post may contain affiliate links. Regardless, I only recommend sites I've researched and/or used and trust. Do you miss your former hospitality job that you once enjoyed? Do you still want to work from home? Are you ready to work from home for some of the top names in the hotel industry? Well, if you answered yes to any of these questions then “listen up.” There are top hotel chains that are willing to hire you to work remotely from home doing a wide variety of jobs ranging from guest services agent to reservation desk agent to writer. It is really a matter of choosing what you want. 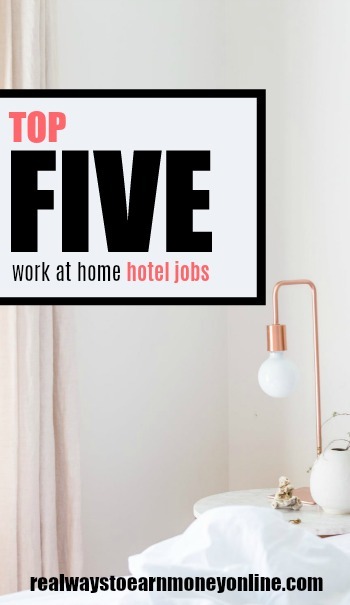 This article will explore five work from home hotel jobs, give you an idea of some of the remote jobs offered, and then tell you where to find the jobs. Note that the one major downside to these companies is that almost all of them are location-based jobs. So, What Are the Five Work From Home Hotel Jobs? Let me begin by saying I came up with a list of about nine. However, I will give you what I believe to be the top five chains offering remote work. Now, we will explore each one individually, and I will also throw in a bonus for another website that hires remote workers to do other unique types of work in the hotel industry. The good news is that all five of these would be employee-based with benefits. Headquartered in Phoenix, Arizona Best Western Hotels were recognized in 2016 as the third top employer in the Phoenix Business Journal's annual Best Place to Work category. They have also been recognized in Forbes Magazine for their contributions to mid-size companies. On their jobs website you will occasionally see a remote reservation clerk position, which usually will be offered to those current employees first or at least those who have been there six months or longer. However, I have seen occasional freelance travel writing jobs on Indeed for Best Western. My advice would be to go to both Indeed and their website and sign up for job updates. This hotel is the one that most people think about when they think about working from home. Since 1919 when Conrad Hilton started the hotel chain in a small Texas town, the Hilton has always strived to be a leader in the hotel industry. The Hilton does hire remote reservation agents to make and change hotel reservations for guests worldwide. In the past the Hilton only hired remotely in Dallas, Texas and Tampa, Florida. However, I have been getting notices of jobs in Virginia and Maryland which are remotely located. As the hotel chain continues to grow, it would be wise to keep checking in your area. Most of these jobs are around $13 an hour. There are also freelance travel writing and food writing jobs (restaurant critiques) for the Hilton Worldwide on Indeed, ProBlogger, and FlexJobs. These jobs will vary in pay rates. If you're interested, we also have a full review of work at home jobs at Hilton you can check out. Most people have heard of the Hyatt, and this hotel chain also has work-at-home positions. However, the Hyatt also needs remote reservation agents. These agents would be making reservations for their local Hyatt Hotels. Most of these jobs fall in the $12 to $15 an hour range. The reservation agent jobs are posted on their website, Indeed as well as AdministrativeJobs.com. There are also remote freelance writing jobs for the Hyatt posted occasionally at Indeed and ProBlogger. This popular hotel chain began as a root beer stand in Washington, DC in 1927. Then in 1957, John Williard Marriott and his wife, Alice, opened the first hotel there. Now in the 21st Century the hotel chain offers remote hotel jobs. While these jobs are remote, you must live within a certain radius of the hotel's location. You must also train on-site for 90 days before working from home is even an option. The pay for working on-site is $10 to $13 an hour and may vary when working from home. You may search their job website mentioned above as well as Indeed or Monster. If you have a local job search website, you might also want to sign up there for alerts. For example, my local job website would be the Jobs Section of the WashingtonPost.com. This hotel chain probably has just as many resorts as it does hotels. This hotel chain occasionally hires both remote reservation agents as well as freelance event planners. It appears to hire both in the United States and Canada for these positions. You can certainly look on their website mentioned above or Indeed seems to have the best selection of Omni jobs. The pay tends to vary by location, and you would also have to live within a certain radius of the hotel that hires you. For the reservation agents, it appears to start around $11 an hour. What Was the Bonus Job? The bonus job was a company called Oyster. Oyster hires freelance travel writers to go in and review the hotel and then write about it. This would be a good freelance job for those who have already worked in a hotel in some sort of capacity as you could be reviewing a wide selection of hotels. Oyster also occasionally hires inspectors, which are similar to mystery shoppers, to go into hotels and inspect, photograph, and investigate the hotel or resort when it receives a bad review or too many customer complaints. Many times these positions are posted as “travel writer”, “freelance photographer” or “hotel reviewer”. You really have to read the job description to see if these positions are just writing, reviewing or photography or more in line with an inspection-type position. These jobs are posted on Indeed and FlexJobs. If the hospitality industry has always appealed to you, now is your chance to search these websites and try to find a work from home hotel job. P.S. – If you're in search of even more legitimate home-based jobs, we suggest a subscription to FlexJobs.com. Each lead posted is carefully hand-screened for legitimacy. Also, the focus of the site is on work at home and flexible jobs. It's also very easy to cancel whenever if you don't think it's worth it, and you will not be billed for additional months. For a limited time, you can get 30 percent off a monthly subscription to FlexJobs using promo code AFFILPROMO. For those who are thinking about applying at Omni beware. I worked at home for Omni for over a year. They shave your commission, which is decided by the QA team who were to vague. We use to have weekly reports to let us know how much we booked in revenue,and how much we could potentially get in commission. So lets say you had the potential to earn $200 you would only get like$15 with no clear explanation. The best they could come up with. It was always you could of done this so you are not getting your money even though you were able to get the reservation. No weekly meeting with your boss, so if your time needed to be corrected it was always done after the fact,and to late to get proper payout. Constant system issues, one time there soft ware just completely crashed for about 13 hours. Instead of logging off they had us go online to the public websites, and make reservations. In the notes we had to leave are agent so we could get credit for the reservation. Really? Oh,and if you had a schedule day off,and it fell on a holiday then to bad you had to work with no scheduled day off later in the week. So just 1 day off that week. Also if you tried to bid to work an earlier time, they ignored it. In conclusion to me it’s not worth working at home but, in center was not much better.